Alpha is the latest generation of high performance self-propelled sprayers from HARDI Australia . 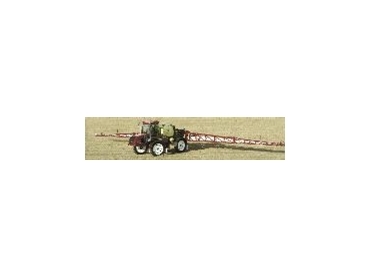 The overall layout of the machine is designed with the operator in mind to provide efficient operation of the day to day spraying tasks. HARDI Alpha comes with a list of features and equipment larger than ever before. Practical and efficient SmartValve Fluid System. All fluid function valves are easily accessible and grouped together. The use of multi-way valves (Smart Valve) simplifies the control of the major spraying functions. 4 wheel drive and selectable 4 wheel steer are standard on the Alpha. High ground clearance makes the Alpha the right choice for a wide variety of crops. Alpha is adaptable to a number of uses from row crop to broadace agriculture with a choice of axle widths from 2 – 3.4 metres and low ground compaction characteristics. An excellent turning circle makes the Alpha the right choice for row cropping applications. The shape of the 4100 litre tank is integrated into the design of the whole sprayer. The tank has been designed to allow excellent visibility behind the sprayer. The rinse tank is also integrated into the design of the main tank. Two coil springs on the front axle and one coil spring at the rear axle, ensures excellent driving performance without operator fatigue. A new series 210 hp 2012 series DEUTZ engine is utilised in the ALPHA. This engine possesses high torque combined with excellent power and fuel consumption and meets the latest emission standards. A safety locker of 180 litres allows storage of containers or various accessories used during the work. (Locker substituted if foam marker ordered).